Austin at Big Design 2013 in Dallas. Austin Govella is an Experience Director with Avanade Digital where he helps enterprises reinvent how they connect with employees and customers. Prior to Avanade, Austin worked for Comcast Interactive Media where he worked on early versions of Comcast Xfinity. In 2009, he co-authored the second edition of Information Architecture: Blueprints for the web with Christina Wodtke for New Riders/Peachpit, and he’s spent the last few years studying how agile teams, lean companies, and user experience designers can work better together. Prior to consulting independently in Houston, Austin worked as a senior interaction designer at Convio, where he helped design the software that powers some of the country’s largest non-profit organizations. Before Convio, Austin Govella joined Comcast Interactive Media’s IA and Usability team as a Sr. Information Architect where he worked as a project lead on Comcast Interactive’s two largest and most important products: Comcast.net and Fancast (now called xFinity). Comcast.net is a news and entertainment portal used by over 15 million unique visitors each month. Austin also worked on Fancast, a next generation entertainment site that was featured at the Consumer Electronics Show (C.E.S.) in January 2008 and lead all sites on the web in video engagement. Before joining Comcast, Austin worked as a project lead for Satyam Computer Services, one of Forrester’s top 50 global IT integrators. As a member of Satyam’s award-winning User Experience Management group, Austin helped improve user experience at the World Bank while working on projects for enterprise search, mapping (GIS), mobile, intranets, extranets, knowledge management, and workplace collaboration. Austin’s industry experience includes retail, ecommerce, financial services, energy, telecommunications, education, non-profits, and entertainment. His broad expertise spans visual design, client- and server-side development, information architecture, accessibility, interaction design, usability, and digital strategy. 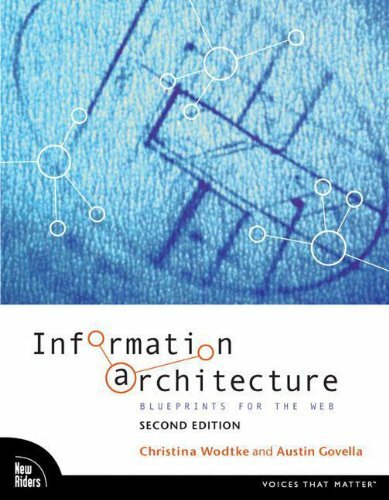 Austin co-authored the second edition of Information Architecture: Blueprints for the web with Christina Wodtke for New Riders/Peachpit. His work appears in the third edition of Information Architecture for the World Wide Web (the Polar Bear book) and The User Experience Team of One. Austin has served as a technical editor for several books including Nathan Curtis’s Modular Web Design, James Kalbach's Mapping Experiences, and Michal Levin's Designing Multi-device Experiences. As an active member of the user experience community, Austin spent seven years as a development editor at Boxes and Arrows, one of the web’s leading design publications, and he is a member of the Information Architecture Institute, and former organizer of Houston Experience Design, a local group for both the Information Architecture Institute and the Interaction Design Association. Austin’s writing has appeared in ASIS&T’s Bulletin and Boxes and Arrows, and he has presented at Agile, SXSW Interactive, Big Design, the I.A. Summit, Intranet Week, and other industry conferences and local meetings for lean, agile, and design audiences in Houston, Austin, Dallas, Montreal, Baltimore, Boston, Memphis, Nashville, Miami, and Philadelphia.